What makes this celestial anomaly stranger still is that Jupiter is accompanied by 6,000 “Trojan” asteroids, the vast majority of which follow the gas giant in a prograde orbit. Similar to a racecar driver going the wrong way around a track, Bee-Zed is careening towards these objects with each trip around the Sun. According to calculations made by Western University astronomer Paul Weigert, Bee-Zed has been doing this for at least a million years, amounting to tens of thousands of successful “laps” around the Sun. So far, it has emerged unscathed from these close encounters. Bee-Zed’s success may not be an accident. As noted in the study, Jupiter’s gravity is causing the rogue asteroid to weave in and out of the planet’s path each time the two objects pass. 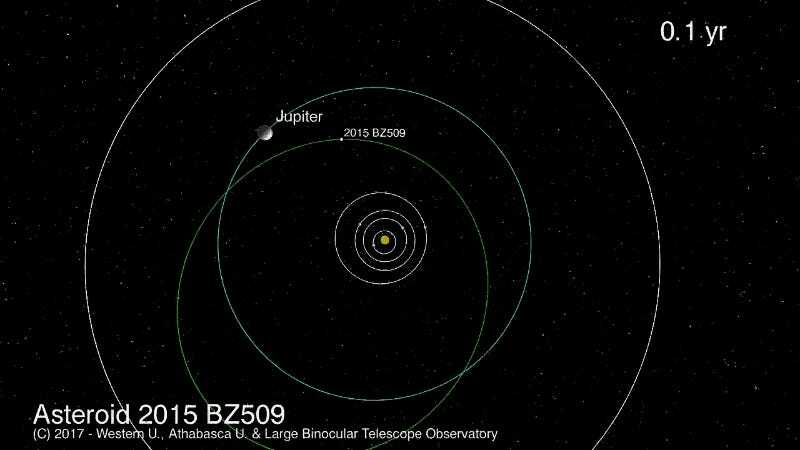 It’s the only asteroid known to have this relationship with a planet, and this state of “synchronicity” should allow Bee-Zed to avoid a catastrophic collision with Jupiter for the next million years at least. This analysis is based on calculations and observations made with the Large Binocular Camera on the Large Binocular Telescope in Mt. Graham, Arizona. 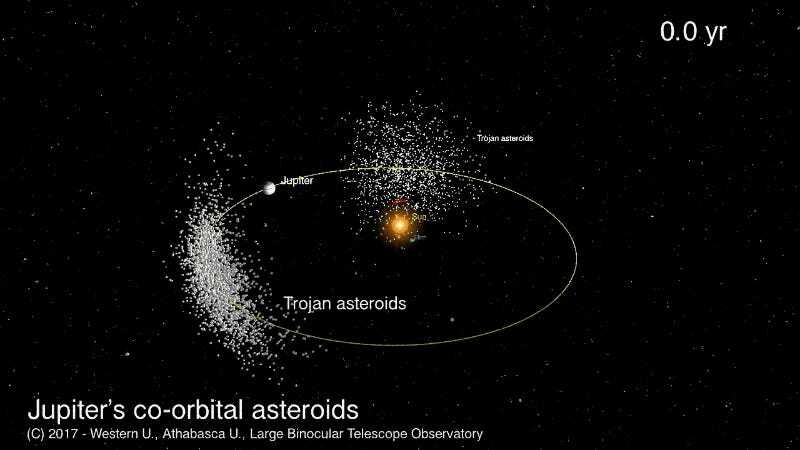 The asteroid may not smash into Jupiter any time soon, but it’s less clear if Bee-Zed will smash into one of the Trojans. Not much is known about Bee-Zed, which was discovered by the Panoramic Survey Telescope And Rapid Response System (Pan-STARRS) in 2015. And although astronomers presume it to be a rocky asteroid, they aren’t even entirely sure—it could be an ice-covered comet. In fact, it may have originated from the same place as Halley’s Comet, perhaps the most famous retrograde object in the Solar System. 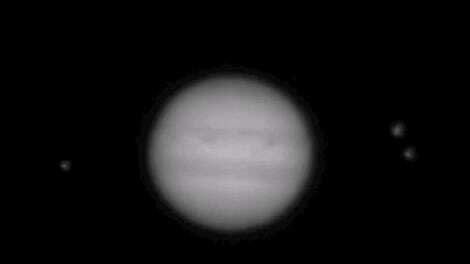 Correction: An earlier version of this article claimed that some of Jupiter’s Trojans are in retrograde. This is not the case. Aside from Bee-Zed, there are none. Gizmodo regrets the error.